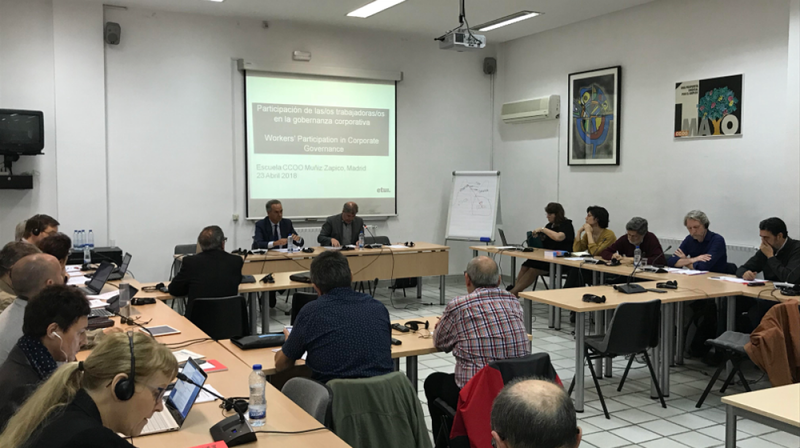 In a first round table, social partners discussed around workers’ participation in the Spanish context, revealing different understandings of the term. Unai Sordo (General Secretary of CCOO) pointed out that the company level can hardly trigger social change in the current Spanish labour market (e.g. pre-eminence of SMEs, temporary contracts, outsourcing), so unions should prioritize re-establishing social dialogue, sectoral collective bargaining, fight for wage increase and against temporality. Jon Bilbao (Basque employers’ association Confebask) argued cooperation could favour companies’ flexibility, innovation and competitiveness, so workers’ participation -in the sense of workers’ direct implication in company management- could support these goals. In the second panel, Mario del Rosal (Universidad Complutense de Madrid) focused on workers’ participation in property via collective funds as those existing in Sweden in the 1980s based on Rudolf Meidner ideas. Complementing this, Isabelle Ferreras (Université Catholique de Louvain) dealt with workers’ participation in the government of the firm, presenting an innovative proposal for egalitarian form of government in the firm (“Economic Bicameralism”) based in her new book Firms as Political Entities. Saving Democracy through Economic Bicameralism(2017, Cambridge University Press). In a third panel, Paul de Beer (AIAS, Universiteit van Amsterdam) gave an overview of the state of workers’ participation based on Eurofound’s 2015 European Working Conditions Survey and 2013 Companies Survey. Workers value participation more than managers, but participation is often narrowed down to information, but only rarely translates into real co-decision. Sara Lafuente Hernández (ETUI) presented the state of board-level employee representation in Europe, reviewing arguments for and against company codetermination and existing varied regulations on the matter in different European countries. Finally, Karin Aberg (Unionen, Ericsson), Philippe Lepage (CGT, Engie), Óscar Romero (CCOO, Fresenius SE & Co.KGaA), moderated by Aline Hoffmann (ETUI), discussed about their own experience as worker representatives in company (supervisory) boards. They generally valued such participation (e.g. privileged access to quality information, effect of filter to management decisions), informed about how does a board work (e.g. political work is often central outside formal meetings), and addressed challenges and limitations of their role (e.g. possible conflict of interests, confidentiality, prohibition to cumulate mandates, inability to organize workers from such platform). The discussion revealed different national practices, confirming cleavages between adversarial and cooperative industrial relations’ cultures generally based in trust and transparency. This workshop initiated a series of EWPCC workshops in collaboration with local affiliates and social partners, intended to promote debate and exchange of knowledge and practice about board-level employee representation in countries where this topic remains tangential in the political and research agenda.